At Life Essentials Day Spa we use products designed to give our clients the highest level of satisfaction during their massage. 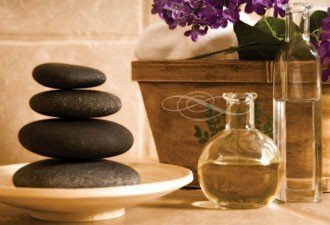 As an added benefit to our clients we offer doTERRA Essential Oils that you can add on to your massage treatment. Essential oils can help with relaxation, balance and muscle soreness. Lavender: Lavender is best known for its calming and relaxing properties. This essential oil has been used as far back as Egyptian and Roman times. For massage, lavender can help you unwind and relax so you can get the most out of your massage. Used sparingly lavender may also be effecting in reducing the appearance of skin imperfections. Deep Blue: For those clients who have tight muscles we always recommend using doTERRA’s Deep Blue Rub. The rub is a mixture of Certified Pure Therapeutic Grade essential oils including Wintergreen, Camphor, Peppermint, Ylang Ylang, Helichrysum, Blue Tansy, Blue Chamomile, and Osmanthus. This rub helps relax and warm muscles while providing a cool feeling on the skin. This is a great rub to take home and use as needed after along day of skiing or snowshoeing. Wild Orange: Wild Orange is an uplifting oil that helps energize those feeling a little depleted of energy. doTERRA’s Wild Orange also helps stimulate and support a healthy immune system. This is a great preventative oil for when colds and flus are going around. Wild Orange has antioxidants that help maintain health and cleanse the body. Balance: Warm and woody, Balance helps encourage a sense of calm and wellbeing. In their Balance oil doTERRA blends Spruce, Ho Wood, Frankincense, Blue Tansy, and Blue Chamomile with Fractionated Coconut Oil to promotes tranquility and relaxation. The overall effect is one of harmony, grounding and balance. If you have sensitive skin be sure to talk to your therapist before he or she begins working on you with essential oils. doTerra products are available for purchase from Life Essentials Day Spa, however we recommend consulting with an aesthetician or a specialist in our oils before using, as most of our oils need to be diluted before use. We recommend using doTERRA Fractionated Coconut Oil to dilute our essential oils. If you are ready to experience balance, tranquility and relaxation, book your massage now and be sure to add an essential oil to enhance your massage.